Are you are always bragging around the water cooler about how clever, adorable and entertaining your super dog is? Is your desk an open album of selfies with you and Fido at the beach or curling up on the couch? Do you feel a pang of guilt each morning when you have to do the usual distract and disappear manoeuvre when leaving home for work? Well, you’ll be pleased to know that there is light at the end of this week! June 21 is international Take Your Dog to Work Day, a pooch friendly day that will see dog owners from around the world share their desk with their best friends, all to promote pet adoption. While it’ll be a chance for your colleagues to meet your pooch ‘in the fur’ and see for themselves exactly what you’ve been bragging about, there’s ample research indicating the potential benefits of your dog joining you in the workplace. According to a preliminary study conducted by Virginia Commonwealth University last year, dogs in the workplace were found to lower stress and increase job satisfaction among workers. Researchers compared stress levels and job satisfaction of employees who bring their dogs to work to those who don’t and employees without pets. The safety of your dog and colleagues are paramount and there are a few things you’ll need to tick off the list before Friday. Is your pet identified with a microchip containing current contact details? Is your pet up-to-date with his or her vaccines? Is your pet trained and socialised with dogs and people? Is your workplace a safe and suitable place for your dog during the hours you will be there? 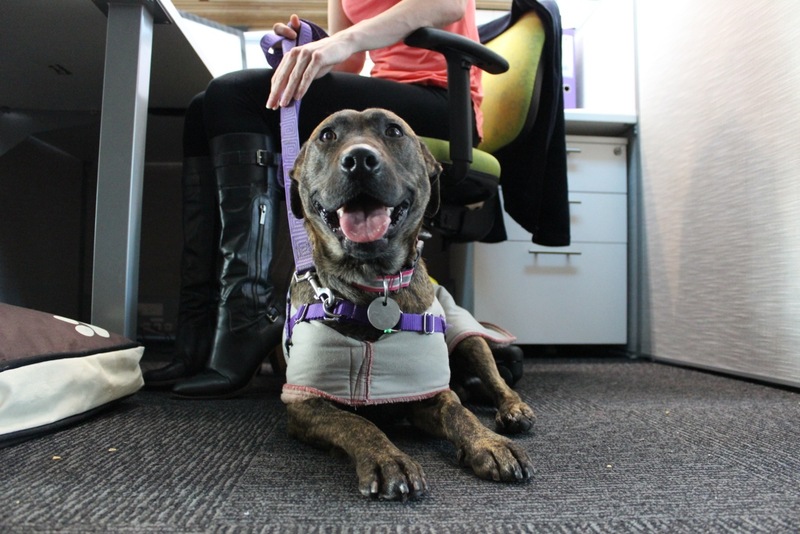 Does your employer think it is appropriate to have your dog at work for the day? Are your colleagues comfortable working with your dog in the office? Bring your pet’s toys, blanket/bedding, food and water bowl to keep them occupied but also comfortable in an unfamiliar location. Remove any poisonous plants or easy to reach hazardous objects your dog can get to. When you arrive in the morning, give your dog some time to say hello to your colleagues or other dogs at work. Avoid forcing co-workers into interacting with your dog. Designate a place for your pet, most preferably near your desk. Plan your pets feeding times and toilet breaks. Take your dog for a good walk or walks throughout the day. Be ready to clean up their accidents – frequent toilet breaks should however, minimise this. Rewarding calm behaviour reinforces calmness and will hopefully be repeated in future visits to the office. If your dog is showing signs of distress or discomfort, the best thing to do is to take him or her home. Interested in adopting a cat or dog? View the profiles of our fabulous felines and adorable canines or call your nearest shelter for further information.